I use the Kingston stovepipe wobbly baffle, designed by Ron Kingston, Charlottesville, VA. This is basically a baffle to ward off ground predators; i.e., snakes, raccoons, cats, field rats, and mice. It is considered one of the best guards out there for most ground predators. It’s not 100% fullproof, but it’s worked well for many bluebirders, including me, for most boxes. Black Rat Snakes are my #1 ground predators for my boxes. The other ground predator possible are ants, which do not seem to be a problem on my trail. This baffles does NOT hold back ants. I should mention this video of a snake is not one of my trail boxes but a box in my County–the monitor shared it with me–arrived at the time the snake was attempting to find those bluebird babies. Snake foiled and bluebirds fledged! Phew! Ron Kingston stovepipe design guard (for snakes and other ground critters!). See link to get the design to make one inexpensively. Stovepipe is 8″ by 2 feet long and the Noel guard is made of a heavy guage hardware cloth, difficult to bend. Nesting bluebirds liked this box. The House Sparrow (see HOSP Control page) and the House Wren (HOWR) are predators to bluebirds and their young. House Wrens can attack bluebird eggs and nestlings. There is a video of the House Wren attacking bluebird nestlings on my Problems page. The House Sparrow is a killer of our native birds. Jays and other avian predators, even woodpeckers, can bother our cavity nesters. I appreciate the thought on selling items, but I have in no way any time or energy to be in the sales business. Plans for people to make them on their own are on the Internet. This is the plan I use. This PDF is offered for free on the VBS website: http://www.virginiabluebirds.org/wp-content/uploads/2012/12/BB_Guards_12-11-2012.pdf It’s the Noel Guard that is even sturdier than the original design, even though VBS lists it as a Cat/Raccoon Guard. It also can help thwart snakes by pronging out the edges and also stops large avian predators from getting an adult at the box’s entry hole, like a hawk. Oh, and btw, the house is mounted on a 6′ tree stump, but we haven’t had problems with other predators… yet. You will, don’t worry…..easy pickins’ for predators. Good luck. Just wanted to mention that I found this site in my effort to find out how to protect my brother-in-law’s BB house from WOODPECKERS. Don’t trust that they are just curious. He saw one pulling the babies out and throwing them to the ground, and when they were placed back in the nest and the woodpecker shooed off, it came back the next day to do it again. It was one of the mid-size woodpeckers, not the downeys. I am going to try the wire guard, but if anyone has a good idea, please let me know. Thanks! A sturdy Noel Guard is what I use on all my trail boxes. I highly recommend them for thwarting off woodpeckers, too. I saw a woodpecker looking in my bluebird house. what kind of problems can arise from this? I am afraid the woodpecker will deter the bluebirds from coming back to their house. There is one egg in the nest. I think that woodpecker was just investigating out of curiosity. I’ve not had woodpecker issues. However, most of my boxes have the Noel predator guard over the entry hole. Only the Downy Woodpecker might roost in it during the winter. Many may peck at the entry hole. I do not see a worry for bluebird eggs inside. I know bluebirds with eggs or young will be highly bonded to taking care of theirs inside that nesting box. I wouldn’t be too worried. Sorry for the delay in responding. Busy time here for me so I’m not in my website dashboard as often. By now, your bluebirds may have fledged? Can you please ID the woodpecker you saw? This would help because we have many species of woodpeckers and sizes of those birds. We have our bluebird house on a 4 x 4 pole. We have been happily watching them feed their babies. Today we were alerted by their excited cries to a black snake making his way around the pole. After carrying it away, it wasn’t long before it was back. Unfortunately, it was the snake or the babies & we chose the babies. We may not be there the next time. Until they fly off, what can we do to protect them? We will definitely follow the directions next time for a pole and baffle. Thank you! Thank you for replying so quickly. We ended up catching another black snake within an hour of the first snake, but since then, we haven’t seen another. We purchased the hardware cloth, but can’t figure out how to attach it to the 4 x 4. Hopefully we’ll get this done before it’s too late! Hi, Bruce. Thanks for writing. When you say “cylinder”, can you be more specific on the design? I wish I could see a picture of your nestbox so I better understand and help you troubleshoot how to fix it–it would help me to know how you installed the box (what is holding it up? — a pole, a wood post?) I use 6, 7, and 8′ x 24-inch stovepipe wobbling baffles that hang underneath the nestbox. Some are Ron Kingston’s design that wobbles using hardware cloth in the center at the top inside of the stovepipe (the most effective) and some of mine are the three different widths using a duct cap on a bolt and wobbles on that. Frankly, I’m finding the duct cap on an 8″ width stovepipe (duct) is as effective percentage-wise on my trail as the Kingston’s design with hardware cloth. Just so you know, the purpose of the hardware cloth is the snake smells up the pole and will follow it up to the box and get stopped at the top and attempt to coil and get through and drop back to the ground. The smell of the birds above is stronger by going down the pole through the hardware cloth. . Just so you know, I prefer 8″ width stovepipe baffles (they HAVE to wobble to be more effective!). I’ve had rat snakes get past the 6″ width baffles. Very large and veteran-experienced rat snakes are known to get past even the most effective snake guards, but not always. It’s a small percentage. A nesting box in snake country with no guard at all has a much more chance of losing young inside a nestbox, even if it’s on a pole. The rat snake is an expert climber–it uses leverage by coiling its body up and around and then the scales are used to grip like a rubber shoe. I’ve seen pictures of snakes getting up vinyl siding this way. Some snakes are more expert climbers and more interested in birds nests than others. A cone (or conical) baffle I use underneath a covered bird feeding tray to keep the squirrels off–that works, but some snakes can get past conical baffles 18″ wide. You could try a conical baffle more at the 22 to 24″ width, but it’s not a guarantee it can hold back snakes. 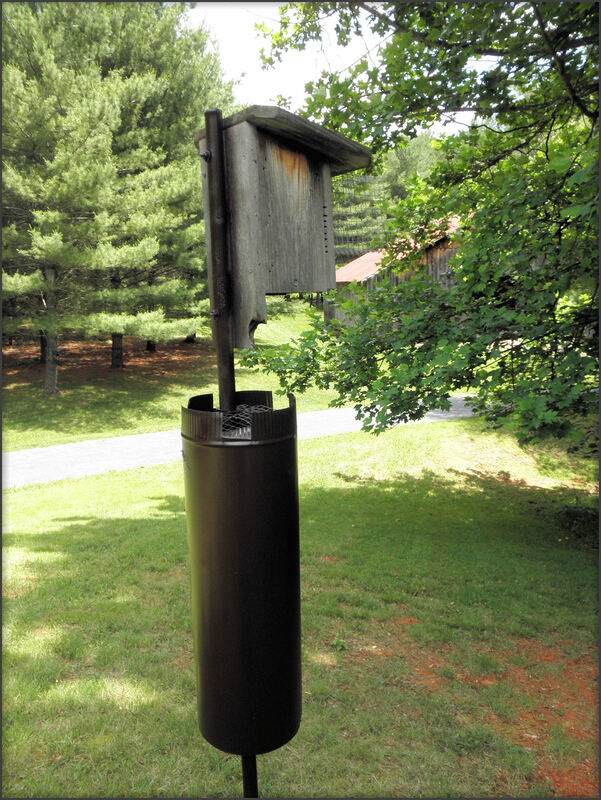 The stovepipe guard (Ron Kingston design which is found on my website) is a much better deterrence for snakes (and other ground critters, including cats, mice, opossum, and raccoons). I don’t believe in the use of barbed wire for two reasons (1) As a naturalist, I am not trying to harm or kill native snakes (2) it can cause harm to other wildlife. The Noel Guard does not hold back avian predators or snakes. However, you could try leaving the prongs out at an angle and away from bird feathers on the Noel Guard, if you want to try that (but I can’t guarantee it will work or not). I’ve had some tell me they don’t get snakes getting past “pronged” Noel Guards. I tend to cringe somewhat on the sharp prongs just like using barbed wire. It just sounds harmful to wildlife in general. My personal opinion is the jury is still out on that. If this helps you at all, I’ve not had a loss to snakes this year to fully-loaded nesting boxes on my trail of 34 boxes when set up on a one-inch electrical conduit and using 7″ or 8″ x 24″ stovepipe wobbling baffles. I don’t know how your nesting box is installed so I can’t make a personal recommendation. If you want to send me a photo of your setup, you can do so at WoolwineHouse@gmail.com. I’m happy to see what I can to help. Not sure who told you the cone baffles is better–not necessarily true–depends on the width of the cone and the size of the snake! Send me pictures, and I’ll help you privately on Email, if OK with you and perhaps get a better idea and send you some designs to consider for snake deterrence (you should think ALL predators to bluebird nesting boxes, not just snakes). I would like to know how to install this. Cannot see front view. Hello. We just came home to our 4 bluebird eggs tossed out and holes poked in them. I am so upset…must be sparrow or house wren. Should we try to move the nest and/or install a noel guard? The BB house is currently on a tree. Help! Hello! Sorry for the delay as I just saw your message about the broken eggs. First, yes, I would recommend you not install a nesting box on a tree–that is like a highway to a predator’s lunch. However, the broken eggs on the ground sound like House Wren to me. I have the same problem going on at a few of my nesting boxes myself. It’s a bit heartbreaking yes–this is nature working with the birds in competition for the nestbox. I am also thinking your box on the tree is in wren habitat. You might consider installing it on a pole (conduit) and bring it out from the trees and brushy habitat, if possible. The Noel Guard is a raccoon, cat, and large avian predator deterrence to get inside the 1.5″ entry hole. It’s highly effective; however, it cannot keep out smaller birds like House Sparrows and House Wrens. One thing you might like to try is have a “wren guard” created and have it hang over the entry hole after you have you next set of bluebird eggs. Here is a good place to see this and the how-to make it: http://www.nestboxbuilder.com/nestbox-predator-controls.html#holeguards Do you keep in mind that the House Wren is a native bird. By federal laws, we cannot evict them if they are truly nesting (laying eggs). They routinely break other bird species eggs because they want that cavity. It’s a bit frustrating, I admit. Keep me posted on things are going! Thank you so very much for taking the time to help us! This was my first pair of BBs….I have been waiting since I was a little girl to see 1 in person. We will make all of the changes you suggested and report back! I haven’t seen the parents since this happened but I will try to stay positive and hope for their return. I have a wren house too…hopefully he/she will prefer that real estate instead! Thank you again for your support! Wrens are rather nasty to other birds….if you want to put up a wren house….put it far away from the bluebird box. This will not guarantee the wren won’t want the bluebird house, though. Good luck. After days without any sign of mr & mrs BB, guess who showed up today?! I was sitting outside when I heard them arrive! We are putting up the “new house” tomorrow morning however, they are already moving back into the old BB house on the tree! Should we move forward with our plan or let them try again at the old site? I don’t want to confuse them or encourage them to leave! Does the wire noel guard deter The House Sparrow and the House Wren? Hi, Marianne. It has not deterred the House Wren on my trail. I only have a House Sparrow problem in one area, an in-town location, but it’s my TEST box (see my tabbled page for info on that test box); that box does not have the Noel guard on it because it’s a two-hole box. After the test box is completed after the 2012 nesting season, I would like to install another box somewhere in that area to see if it does indeed deter the House Sparrow. If the House Wren has enough assertiveness to enter a box with one, I’m thinking the House Sparrow might also. I certainly can ask some of my fellow County Coordinators in Virginia to see what they say about it and can update this post with another reply in the near future. Thanks for asking this question–it’s an excellent one! Would the modified noel guard (made from a plastic milk carton) deter House Wrens? In 2010, I had a BC Chickadee nest in a box with a hole that may be borderline too small for a House Sparrow. As soon as the House Wren came back, it proceeded to remove the Chickadee nest. I hope that the young Chickadees had already fledged, but I am not sure. I would prefer that the Chickadees could have a successful brood. I’ve not heard of the milk carton approach. However, if you need really good info on how to deter the House Wren , I suggest the best bluebirds website out there, compliments of Bet Zimmerman at: http://www.sialis.org/wrens.htm(Remember, it’s a protected native species; so by federal law, we monitors are not allowed to remove nests and eggs and young of the HOWR–we ARE ALLOWED, however, to remove “dummy nests” — this is when the HOWR fills up a nestbox with just sticks to the the ceiling so no other bird species can use that nestbox–a territorial thing the HOWR does. It takes some learning to distinguish the differences between a dummy nest and a REAL HOWR nest. Believe me, I know, as I’ve made the mistake of taking a HOWR nest out that wasn’t a dummy nest! Thankfully, I was able to fix my own problem without harming the birds–I learned quite a bit that day! Learning about all native cavity-nesting birds is what’s good about monitoring. I do know that the HOWR can cause havoc on other birds’ nests, including throwing out the babies of another species. I have a video posted on my site about it….under PROBLEMS. I know it will not deter the House Wren, as I’ve seen them use one of my boxes and bring up a brood with the Noel hardware cloth guard over the entry hole with no problems. Whether it deters House Sparrows remains to be seen. I’ve heard from other bluebirders they think it has deterred them. It needs to be tested. I can certainly write to some of our Virginia Bluebird Society monitors/coordinators, and ask them about it and try to get back here to update this post in the near future with another reply. If anyone reading this knows, feel feel to post a reply here. Thanks! I’m glad you have enjoyed what you’ve seen. The intent is not only to share the joy of bluebirding but also to educate what bluebirding is and why we are so passive about it. The main goal is to help the birds be successful. Bluebirds have a lot going for them and a lot going against them. Human intervention has helped them in the past decade to come back in greater numbers and survive through nestboxes, predator guards, and installing those boxes in habitat that helps them be successful in breeding and fledging bluebirds.